This deluxe double CD set is the fourth release in a brand new series which re-issues the legendary Cilla Black’s original albums. 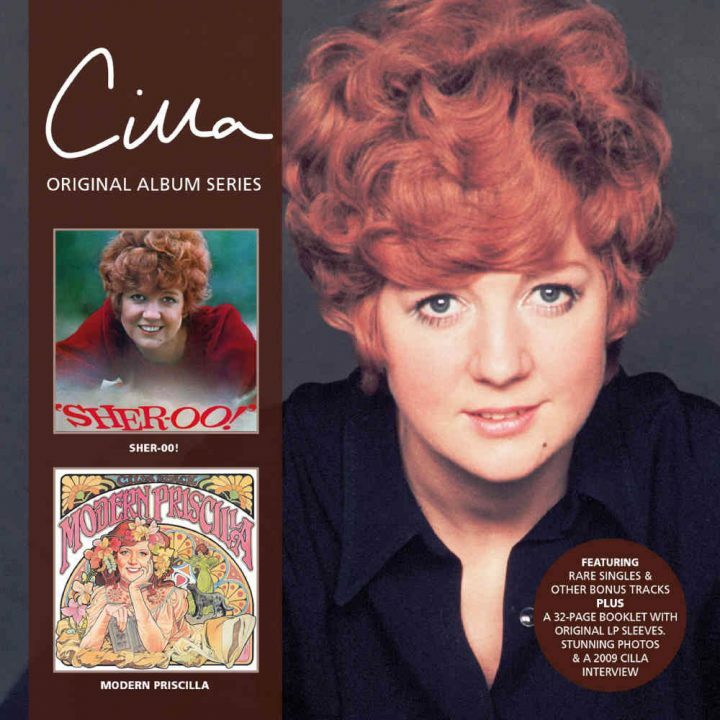 In this package, Cilla’s all-time favourite of all her albums “SHER-OO!”, from 1968, is paired with her 1978 disco fuelled pop album and Cilla Black fans’ favourite “MODERN PRISCILLA”, which is released for the very first time on CD. Both albums contain a wealth of bonus tracks; in fact, there are 21 bonus tracks in total across the package. Tags: cd, cherry red records, cilla black, modern priscilla, pop, sfe, sher-oo! • This deluxe double CD set is the fourth release in a brand new series which re-issues the legendary Cilla Black’s original albums. In this package, Cilla’s all-time favourite of all her albums “SHER-OO!”, from 1968, is paired with her 1978 disco fuelled pop album and Cilla Black fans’ favourite “MODERN PRISCILLA”, which is released for the very first time on CD. Both albums contain a wealth of bonus tracks; in fact, there are 21 bonus tracks in total across the package. This release, along with all the others in this Cilla Original Album Series is endorsed by its Executive Producer, Cilla’s son Robert Willis and comes with a 32 page booklet including extracts from a 2009 interview with Cilla, introductory essays about both albums and contemporaneous photographs from both the record company archives and the Cilla Black Estate. • Disc One contains “Sher-oo!” and Cilla was immensely proud of this, her third studio album. She adored making it and considered it to be her all-time favourite long play! • It was whilst on holiday during the recording sessions for “Sher-oo!” that Cilla received the career defining news that manager and friend Brian Epstein had both got her her own series on BBC Television but that also he had died from an accidental overdose. Epstein had adored Cilla and was instrumental in changing her life by launching her career to the dizzy heights of superstardom and British icon. • Completing the sessions for the album, Cilla very much considered ‘Sher-oo!’ to be her tribute to Brian. The final recording which needed to be reworked was ‘Step Inside Love’. This was the signature tune for Cilla’s new BBC TV series and her album’s lead single as was written for Cilla especially by her friends Paul McCartney and John Lennon. • 1968 was overall an extremely successful year for Cilla with her new BBC TV shows regularly commanding audiences of 22 million and both her lead single ‘Step Inside Love’ and new album ‘Sher-oo!’ becoming ‘Top 10’ hits on the British charts! • This re-release of “Sher-oo!” notably includes amongst the bonus tracks, the four songs from Cilla’s 1967 EP “Time for Cilla” which showcase her innate ability to deliver both a soft and tender love song and an emotive power ballad! • Disc two contains fan favourite album “Modern Priscilla” from 1978; her tenth studio album and her last for EMI. Keeping up with ever changing musical tastes, producer Mike Hurst moved Cilla in the direction of the then popular disco style in an attempt to broaden her musical appeal. Mike Hurst had recently set the charts alight with a string of ‘Top 5’ hits that he had produced for Rock ‘n’ Roll revival octet Showaddywaddy. Cilla knew Mike from the early 1960s when he was a member of The Springfields with Dusty and Tom Springfield. • “Modern Cilla” includes several ballads and a colourful array of up-tempo numbers – three of these were penned by Dominic Bugatti and Frank Musker who were the celebrated song-writing team behind disco anthems for The Three Degrees and Bonnie Tyler. • A pre-release teaser, the standalone disco infused single ‘I Wanted To Call It Off’ was released in July ‘77 and by December that year most of Cilla’s new album was completed. Cilla did however return one last time to the recording studio in March 1978 when she gave two of her finest vocal performances of the decade on ‘Brooklyn’ and the hauntingly beautiful ballad ‘Songs’. This session was the final one under her EMI recording contract. • Bugatti & Musker’s catchy song ‘Silly Boy’ was chosen as the lead single for Cilla’s new album and was supported by performances on the BBC‘s Top Of The Pops and Cilla’s new TV special for Thames. The final single to be released from the album was ‘The Other Woman’. • The album’s eye-catching sleeve was inspired by the work of Czech Art Nouveau painter and decorative artist Alphonse Mucha whose work Cilla adored.